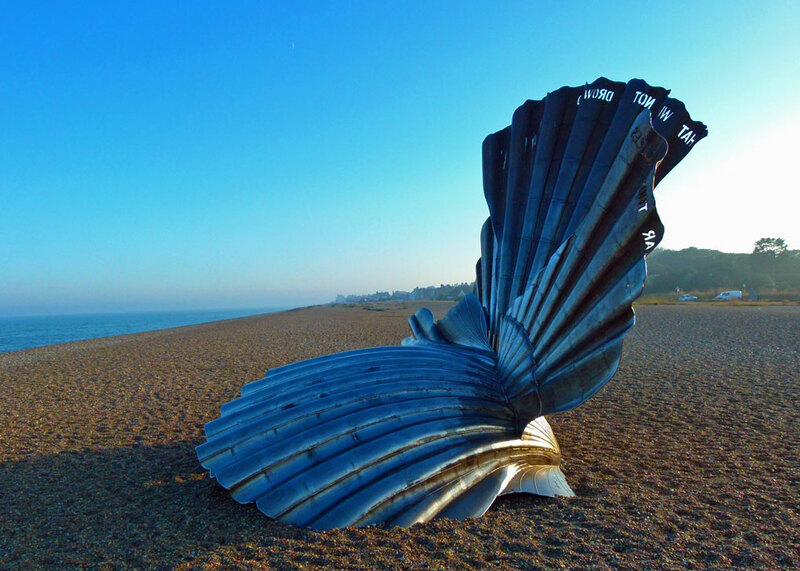 The Scallop sits on the beach at Aldeburgh, in Suffolk. 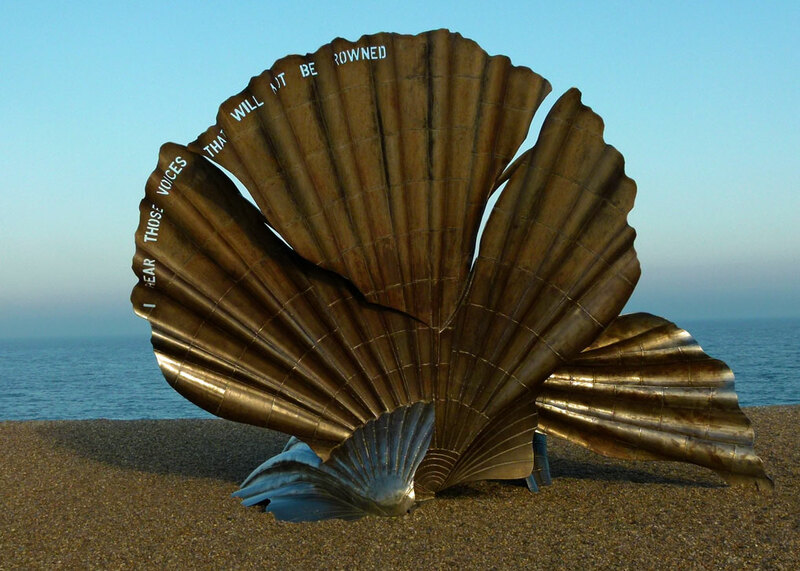 It is a 13 foot-ish (4 metre) high monument, by local-born artist Maggi Hambling, to the late Benjamin Britten, composer and past Aldeburgh resident, who used to take his afternoon walks along the beach. The sculpture consists of two, broken, interlocking scallop shells. Cut into the rim of the upright shell are the words “I hear those voices that will not be drowned” from Britten’s opera Peter Grimes. The Scallop was installed in 2003. It is rumoured to have cost around £75,000 and was paid for by donations, largely due to the fund-raising efforts of the Chairman of Adnams plc (who brew rather fine ales). I think this is an arresting piece of art and, during an A Bit About Britain expedition to East Anglia, the team made a point of visiting it. On a warm September evening, The Scallop looked simply beautiful, its surfaces catching and reflecting the sunlight. We crunched our way across the shingle toward it and it tolerantly allowed a queue of people to take its photograph. I’d like to see The Scallop in different seasons though, especially when the North Sea is at its worst. 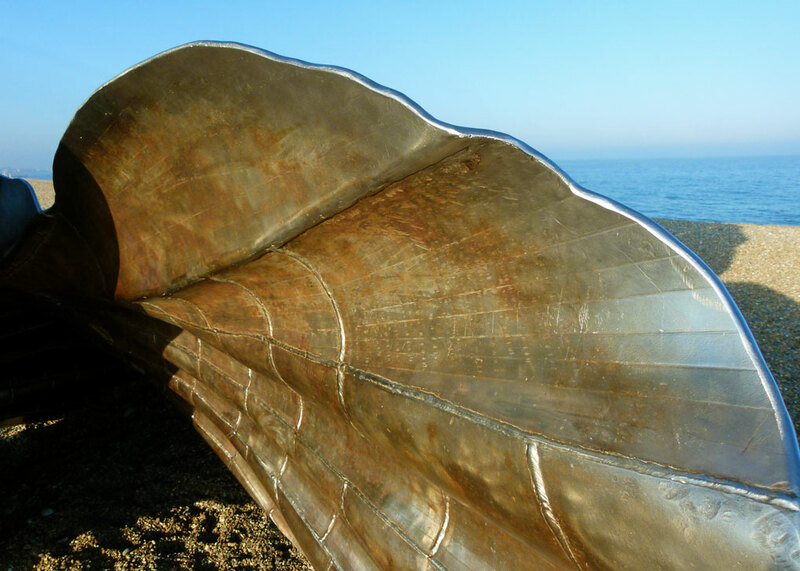 Maggi Hambling described it as “‘a conversation with the sea”. So The Scallop is, appropriately, a piece of audio art as well as a visual one. It has been suggested that the ear is like a shell, so the Scallop is an image of listening. From personal experience, I can also say that you want to touch it; I did, anyway. Just to show I’ve done my homework, and in case anyone’s bored, a scallop shell often symbolises the feminine, fertility and love. It has been used as a symbol of the Goddess Venus, of pilgrims, pilgrimage and saints – particularly of the Camino de Santiago in Galicia and St James himself – and it often appears as a heraldic device. It seems Mr Burton was prophetic. The Scallop has been vandalised several times, with someone daubing imaginative and witty expressions of distaste on it, such as “It’s an old tin can” and “Move it.” On one occasion, the vandal left an opened tin of paint behind (magnolia non-drip gloss, in case you’re interested), as well as the screwdriver used to open the tin. Police are hunting someone who last decorated their house in the 1980s; I’d start with Mr Burton. Well, arguably, the point of art is to create debate. Or is it? And, of course, the appreciation of art is a matter of personal taste. Sadly, the object of the art in this case, to commemorate Benjamin Britten, might have been forgotten in all the excitement. Amusingly, Maggi Hambling actually published a book about The Scallop’s story – good for her – art on art – hopefully, profit on profit. Curiously, the internet revealed few quotes from supporters; but there’s nothing controversial about being nice and, anyway, the sculpture’s still there so the critics lost. But the brouhaha caught my eye, initially because in this troubled world of ours it is so clearly a trivial matter. Our civilisation can afford the luxury of debating the perceived relative merits of baubles. Then, having visited Aldeburgh, I got to wondering what all the fuss was about. 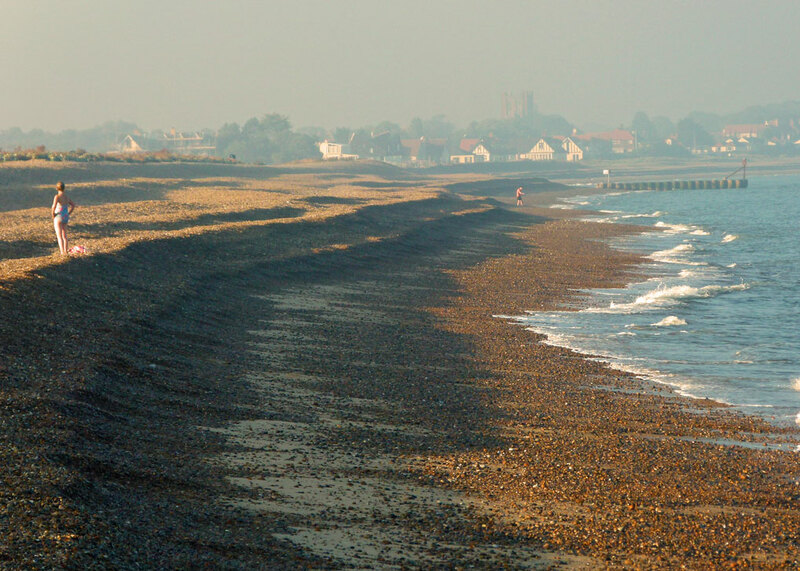 It is a lovely stretch of beach and the sea, depending on its mood, makes it both serene and exhilarating; but, to be fair, as decent beaches go, Aldeburgh’s is fairly unexceptional. Moreover, if you look north past Thorpeness, you get a great view of the very fetching Sizewell B nuclear power station further up the coast. Hmm. Most importantly, Aldeburgh itself, great place though it is, is far from perfect. Nothing that a selective bit of bulldozing and refurbishment wouldn’t cure, but you get my point. A sense of proportion thereby restored, I think The Scallop actually enhances the beach and, moreover, that the good folk of Aldeburgh (population 3,000+) are lucky to have this additional crowd-puller. Most people love it. While we’re about it, something should be done about people leaving decaying fishing boats on an otherwise unspoilt beach. Or is it art? 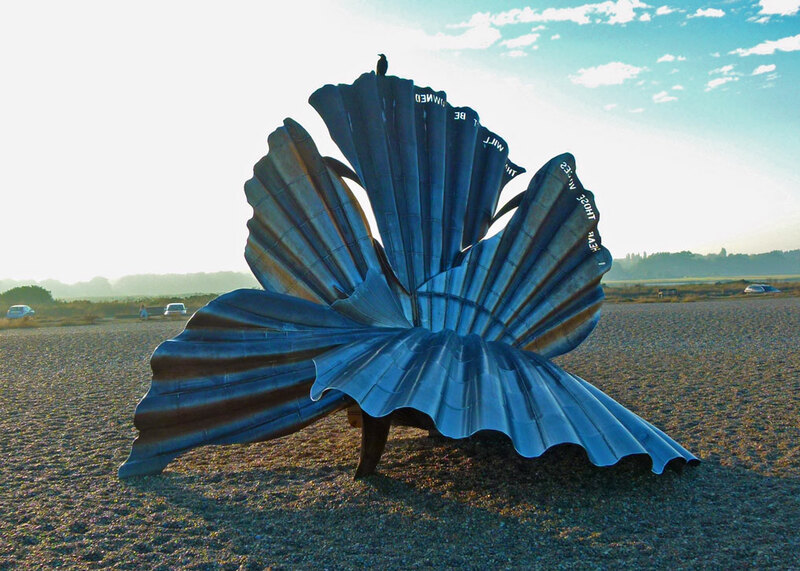 I would love to be near the scallop on a really windy day – there must be a musical element to it, given it is a tribute to Benjamin Britten. Thank you for bringing it to this armchair traveller’s attention. I agree – and think it’s wonderful. Thanks for looking in and leaving a comment! I enjoyed reading your post, and I must say I love the picture of the boat you finished with too! Interesting comparison with the rotting boat and the sculpture. Which should be removed? They both look quite photogenic. As to the discussion about the quality of the beach, is a bit of a joke for me as we are surrounded by some of the best beaches in the world. 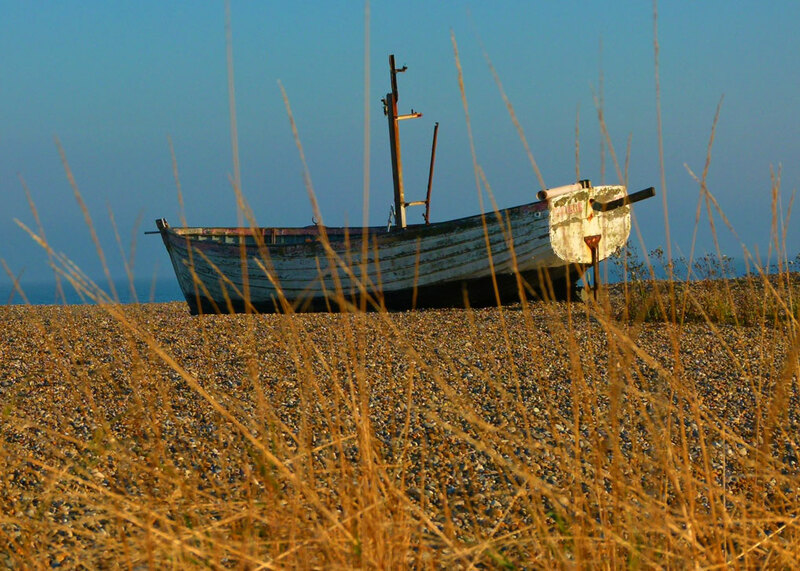 However, Aldeburgh beach has a certain charm in the evening sun. Sorry so many people don’t like it. I thought it was quite nice. Although I do like it I can see both points of view. Public art is very fashionable at the moment but if that was the only unspoiled beach it would take some getting used to as an artist could just as easily put a sculpture in a really isolated spot if a vehicle track reached it. Hard to drawn a line in these matters. Also everyone has instant strong opinions about any art or architecture erected anywhere.. 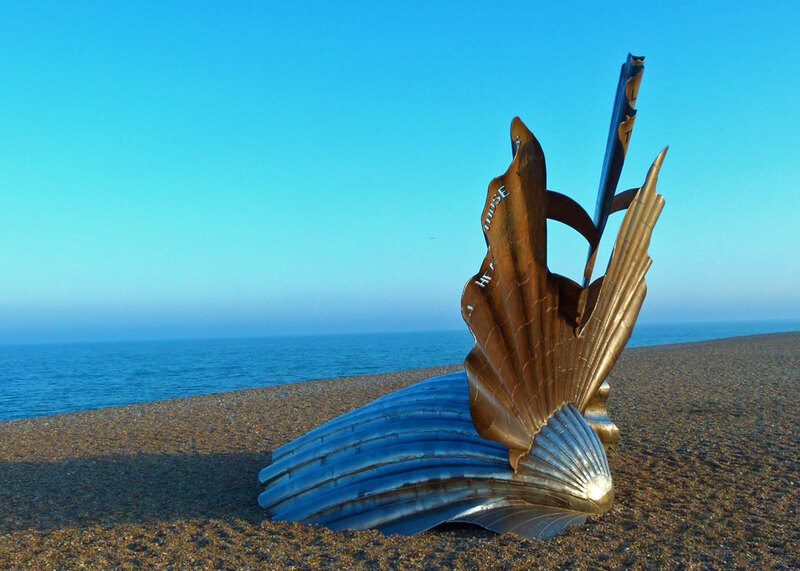 I am ashamed to say I haven’t visited Aldeburgh beach since the Scallop was installed there despite living just a few miles away! I remember the fuss when it was installed there and the local news used to report each time it was vandalised but I think most people are used to it now – at last! I think I’d rather see the scallop than a lot of the junk that is left on the beaches round our coastline. I don’t remember any fuss when Anthony Gormley installed his sculptures on Formby beach! I rather like it which surprises me, I don’t usually go for pieces like it and would have thought I would have sided with the people who wanted the beach unspoiled. But it just seems so right there. Well, at least that’s one scallop that’s not going to wind up in someone’s private shell collection. I like the sculpture – it is an interesting shape and fits in well with its beachside situation. I didn’t realise that Maggi Hambling was a sculptor as well as a painter. I would rather see a sculpture of a potato chip bag. It has more meaning to me personally. But I do like the fishing boat, and laughed at the tin can remark. We live in a wonderful world full of diverse opinions regarding art and just about everything else. It looks an interesting piece of art. Knowing it’s situation is relevant adds to its attraction.